Thank you to everyone who left their warm homes to spend time in Julius Shulman’s world. It was a an intelligent and enthusiastic crowd, and it was a true pleasure to personally meet so many of you. And Marlene Bricker is a joy! Here’s a few photos from the night. Most interesting bit of news from the night is that Shulman’s home is for sale! Within this link are some informative comments about the home, the realtor and its future prospects in a tear-down market. Even better, this link has extensive photos of the home cleaned up for selling. Looking at the shots of his studio made me tear up a bit – can you imagine living there? Let’s hope the family makes sure the buyer is properly respectful. This is definitely a home worth preserving. 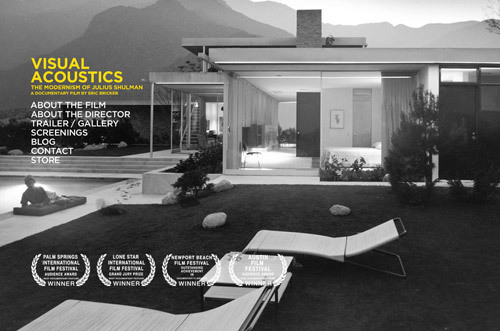 Visual Acoustics: The Modernism of Julius Shulman, a documentary by native St. Louisan Eric Bricker, makes a return engagement to the Moore Auditorium on the Webster University campus, January 29-31st, 2010. Here’s details about the film series and admission. I’m asking you to come see this glorious documentary on Saturday, January 30th at 7:30 pm because I will be part of a Q & A panel after the film, and would love the support of sympathetic B.E.L.T. readers! Yes, Marlene Bricker – mother of the director – asked me to be on the panel, which is so cool and sweet of her. But knowing that my adoration of Shulman could render me a blubbering gush of “wow,” I suggested that the best architectural photographer in St. Louis should also be on the panel, and luckily, Ken Konchel said yes! So please do come out to see us this Saturday. Admission is $6, the film is 83 minutes long, and the 3 of us will take questions directly after. Here’s my farewell tribute to Shulman, who passed away only last year. And here’s my 2008 review of the film we’re lucky enough to see again!